— Armored GURKHA (@TerradyneArmor) 28 июня 2017 г. “I can’t really comment on just seeing some social media pictures. I don’t have any context. I don’t even know where it might be,” Smith said on Monday. On Friday, Global Affairs spokesman John Babcock said that Canada “will review all available information as it determines an appropriate course of action.” Global Affairs Canada is a government’s department, managing diplomatic and consular relations. “The government is actively seeking more information about Saudi Arabia’s current efforts to deal with its security challenges, the reports of civilian casualties, and the reports that Canadian-made vehicles have been used by Saudi Arabia in its current security operations,” the statement added. On Saturday, Prime Minister Justin Trudeau said that Ottawa is reviewing the controversial reports. “We are looking at these claims very seriously… and have immediately launched a review,” Trudeau said, as cited by the Sun Daily. Riyadh is one of the importers of Terradyne Gurkha vehicles, according to the Canadian government website. On Monday, opposition parties and human rights activists addressed the country's authorities on the issue. The New Democratic Party (NDP) sent a letter to Foreign Affairs Minister Chrystia Freeland, calling for arms exports to Saudi Arabia to be suspended, the Globe and Mail reported. “The Liberal government is continuing to allow the export of billions of dollars in arms sales to countries like Saudi Arabia, Libya, and Sudan, even though they have some of the worst human rights records in the world,” the party said in a statement. 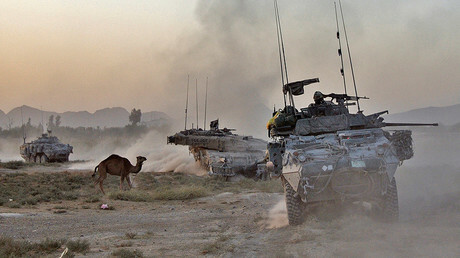 Amnesty International Canada Secretary-General Alex Neve also called on Ottawa to suspend the deal with Saudi Arabia. “Indications that Canadian-made armored vehicles are perhaps being utilized as Saudi forces mobilize in the east of the country highlight how crucial it is that the government intervene and put an immediate end to the Canadian/Saudi LAV deal,” Neve said in a statement. Saudi Arabia has not yet commented on the reports in the Canadian media.